Witness fuller-looking locks with Grow Gorgeous' Hair Density Serum Intense, Density Shampoo Intense and Hyaluronic Density Conditioner. Working in synergy to promote longer, denser-looking hair, each product utilises a host of technologies to leave every strand feeling stronger, healthier and fuller-looking. 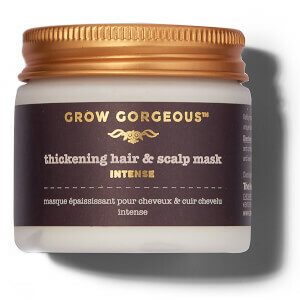 An advanced hair and scalp conditioning formula that works to visibly increase hair thickness and restore softness. An innovative form of Hyaluronic Acid is combined with amino acids, biotin and B-Vitamins to stimulate hair follicles for a fuller appearance. 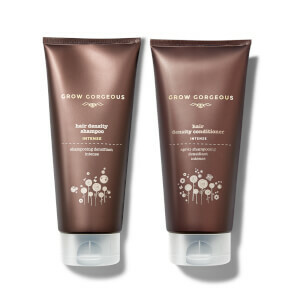 Suitable for all hair types, including colour-treated, the conditioner combats and addresses thinning hair so you can experience dramatically improved hair density. I bought the intense serum on its own before I bought this set and I was so glad that I did. The application of the serum is super easy and it helps that it smells lovely! I found that within 15 days my hair was shiny and healthy from the scalp down. I'm looking forward to see how the shampoo and conditioner will amplify the treatment. I purchased the hair density serum intense, as well as the shampoo and conditioner as a package deal. I also received a sample of the 11-in-1. The smell of the products are quite pleasant - it is a clean smell. I parted my hair along my scalp 5 times, applying 4 drops along the part, massaging it in each time. At first I thought, "OMG this is going to make my hair oily!" The next morning the product was completely absorbed and it wasn't oily. In fact, you couldn't even see any trace of the product. I washed my hair with the shampoo and conditioner, and was pleased with the results. Hair was soft, clean and manageable. I have been using the products for 1 month now: * My dry, itchy, dandruff-ridden scalp immediately disappeared after day one. I'm not kidding. * No residue or sticky/tacky feeling on my hair. * I noticed new hair growth within a week and a half.